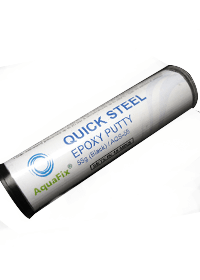 AquaFix® RAPID STOP is a self-fusing silicone tape that can be used for leak repair and electrical insulation/sealing. It works by molecular fusion of the compound substances which are activated to their most effective levels by stretching the tape on application. RAPID STOP is the perfect product for those emergency situations where you need to stop a leak fast! The unique properties of this product will permit a LIVE leak repair without turning off the water. By stretching and winding individual 25mm wide x 300mm ( 12” ) long pieces of the tape around the leaking pipe you will gradually be able to stop the flow of water.